We built our home 11 years ago and we are just getting to things that we thought we would do right away. I am now so grateful that we didn’t make the changes earlier and spend the money for the upgrades earlier because I think I would be wanting to rip them out now. 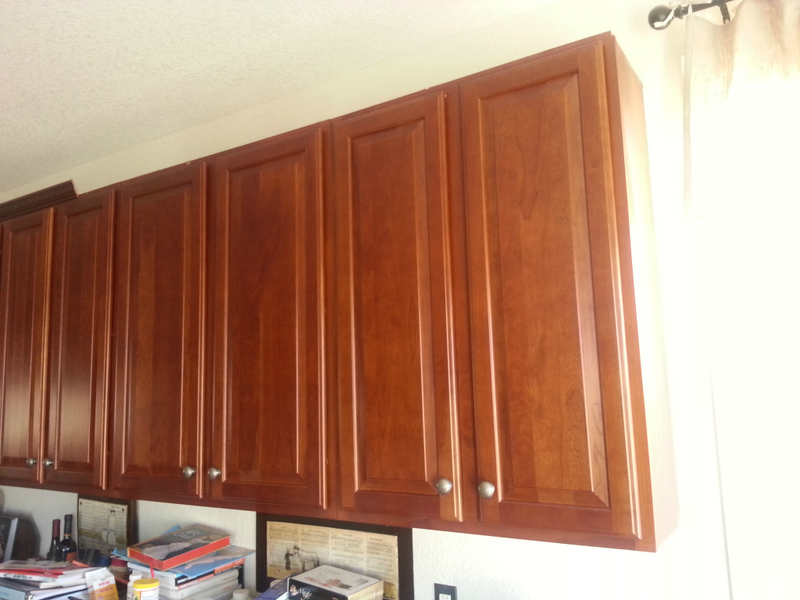 One of the biggest upgrades to our home was the cherry floors we added and the cherry cabinets. The cherry floors have always added so much warmth to our home but they are also a really soft wood. As we have re-painted and slowly changed the home over the past years the kitchen was the area that we didn’t tackle because of the cost. We love the quality and style of the cabinets but I have been begging for a few years to paint them. 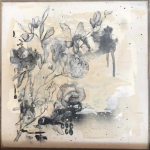 They are such nice cabinets that even friends that visit could understand Kelly’s reluctance to paint over them. Another area we hadn’t upgraded was the counters. We had always assumed we would do that on our own and save the money going through the builder. After a few years being in the home we bought black granite tiles, all of the tools and it all just sat in the garage for two years until we sold it all on Craigslist. For real. We just couldn’t pull the trigger on the nicer things we really wanted to add to the home. It was so much at one time and there was always a million smaller things to do. One of the design elements of our kitchen was a crazy angled island that had an upper and lower level. 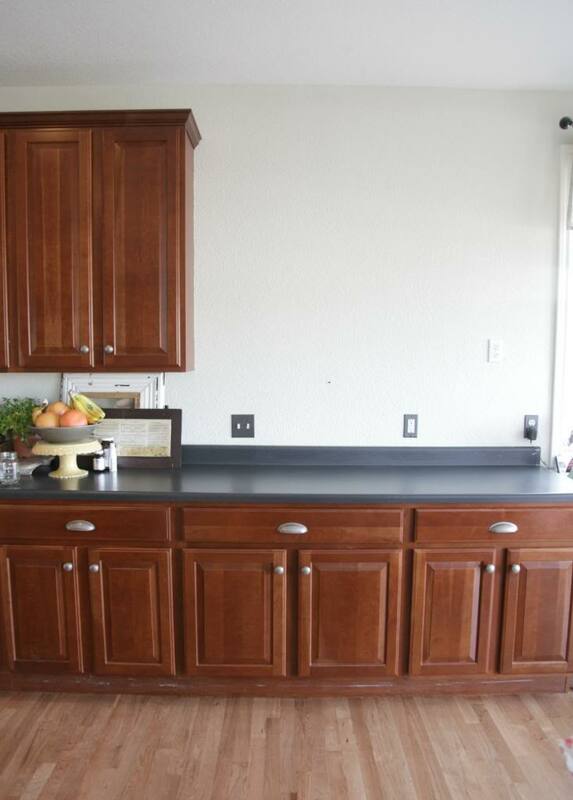 Yes, that upper level hid all of the dirty dishes:-) but it left no real counter space. This now brings me to our floors that were in desperate need of refinishing and 11 year old carpet that was looking worn out and dirty. We decided to go ahead and get the floors refinished and add wood in the living room and my studio (formally known as… the dining room). We went back and forth and back and forth and…you get the idea…about adding a new island. We hadn’t planned for this and the cost was going to be bigger than anyone likes. We decided to just go for it because if we didn’t do it now while the floors were getting refinished our window was really closed until the next time we refinished the wood. You can see the previous progress photos HERE. I can’t wait to show you the changes but we are still not finished but I am hoping to show you the island in a week or so! 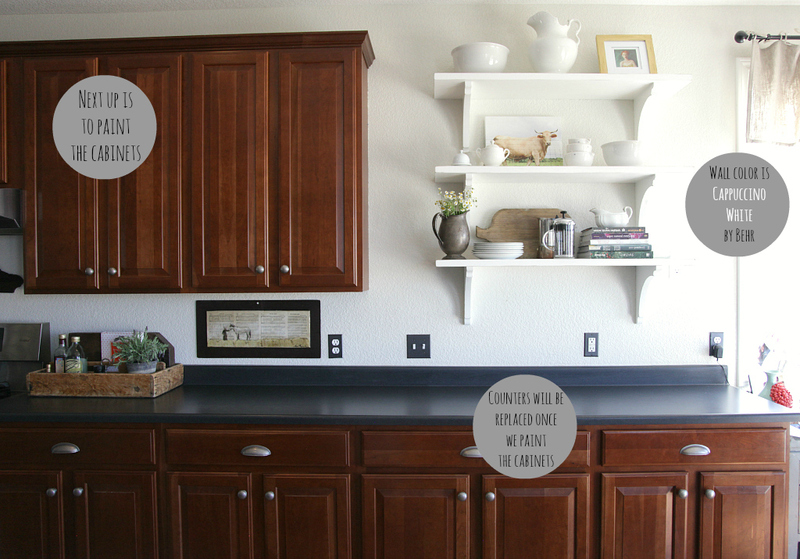 I wanted to show you an inexpensive change we made in our kitchen that made a HUGE difference. I like changes like this because that is usually what most of us can do…little changes over time. Our 17 feet of cherry cabinets was just a large amount of cabinets. I don’t know how I did it but I talked my husband into taking down 5 feet of the cabinets so we could replace them with open shelving. From the moment we took them down the kitchen seemed brighter and more open. When Kelly saw the empty wall for the first time he was not sharing my excitement. We then asked my brother, a cabinet maker, to build us custom shelving. I drew out what I wanted and designed the corbels and he did the hard stuff. My mom, Maddy and I took turns priming and painting the shelves. 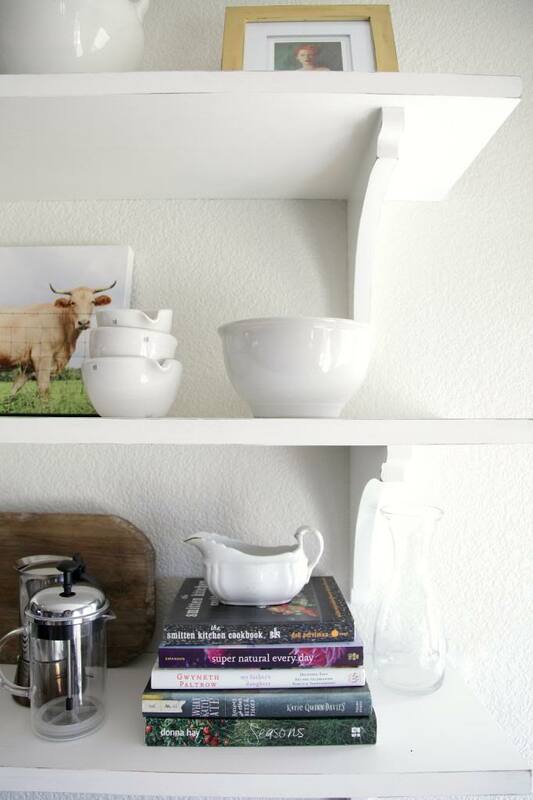 The wall color of our kitchen is Cappuccino White by Behr and we painted the shelves a bright white. 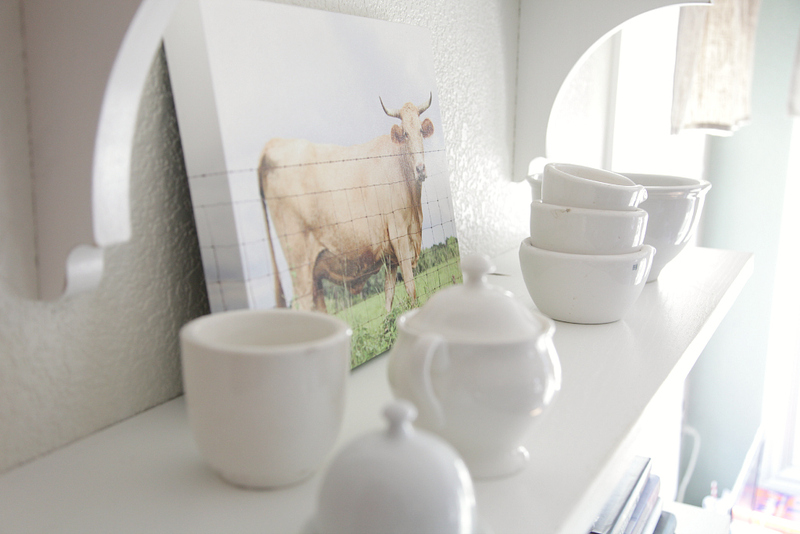 I want to add more white ironstone dishes for every day use but I will just slowly add to my collection. 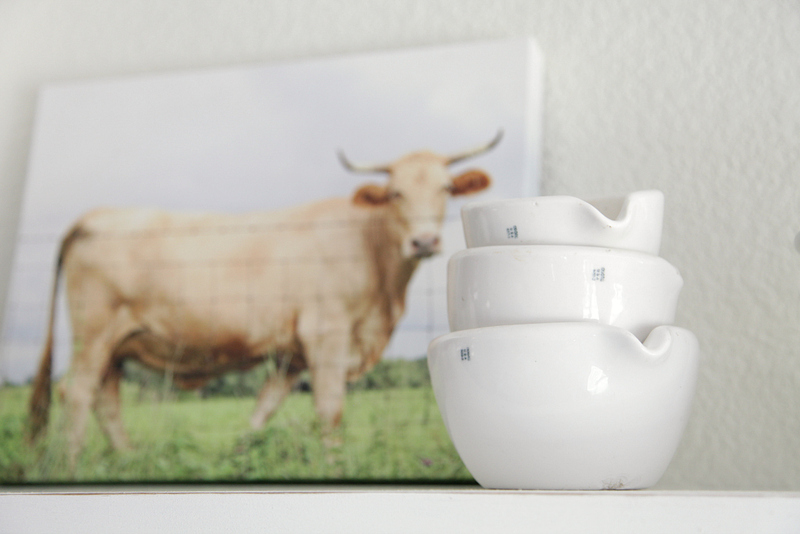 I am thrilled with how they turned out and the difference it made in our kitchen. Join me on Monday when I show you my computer desk. I can’t wait to show you how ripping out the built in desk and replacing it with a real desk added so much personality. 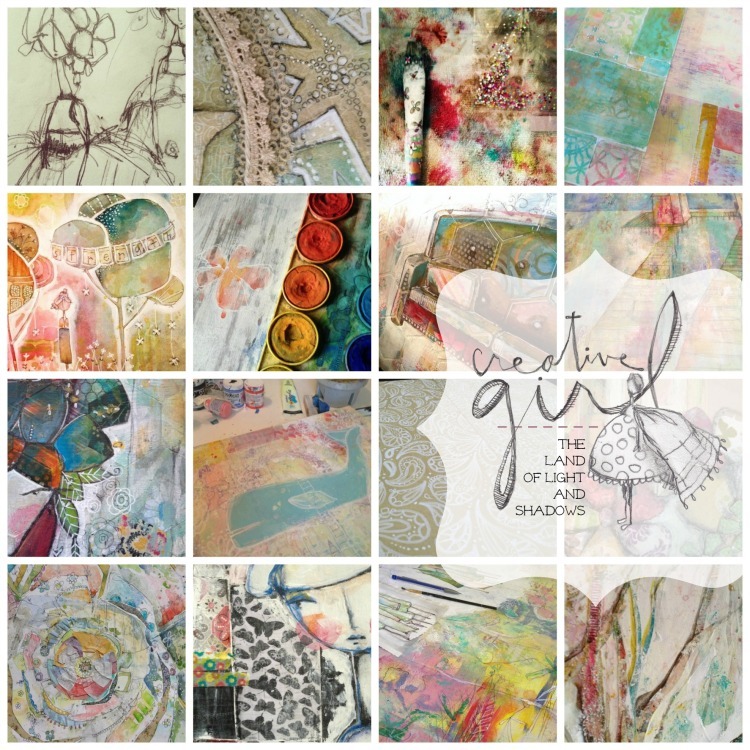 Just a reminder that there is only about a week left to get Creative Girl: The Land of Light and Shadows for the early registration price of $28. Click HERE to go directly to my creative network and sign up. LOVE IT! Every man I’ve known or asked always wants/loves wood and says no, don’t touch it…..and I want EVERYTHING I see painted white. 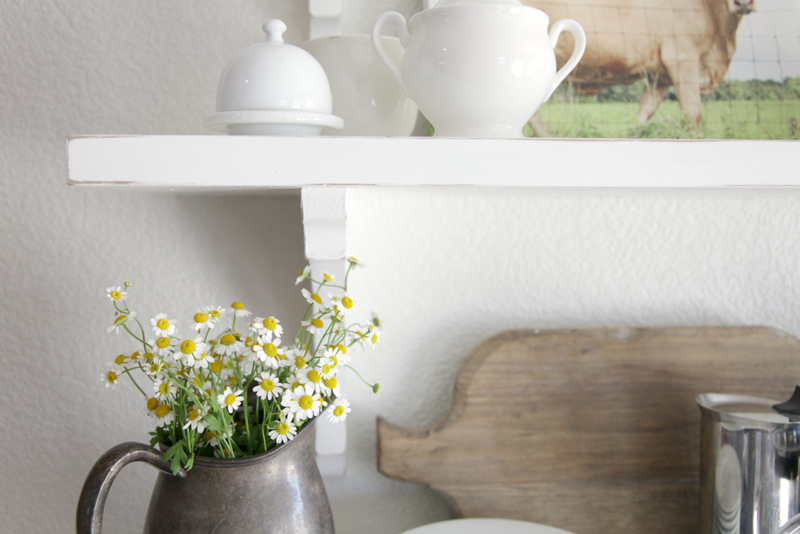 When I moved in my house, I had a painter do the walls for me and asked if he would paint the woodwork white…..he tried to talk around it and finally agreed…then I started pulling out everything wood I could find (dressers, doors, nightstands) and had him paint those. 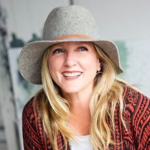 I thought he would faint but even he admitted afterward how awesome they all turned out…..I have to give it to your husband for compromising and allowing you to change your space so you are bliss – LOVE IT. It looks amazing, and I can see your vision. 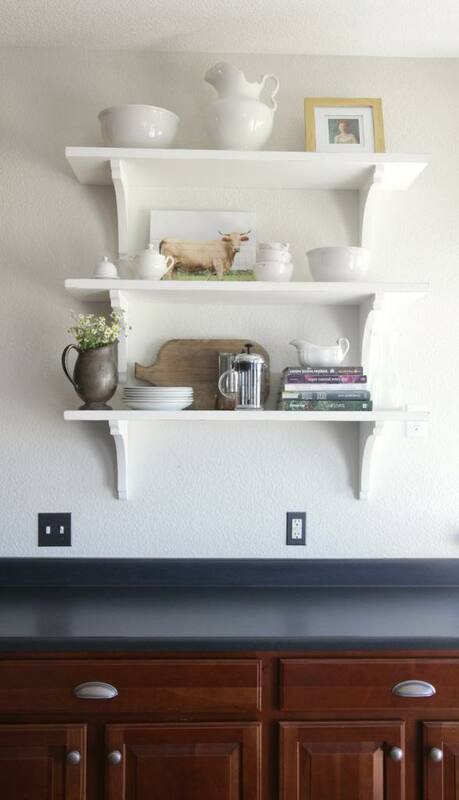 I love this simple addition.. it truly creates such a beautiful softness to that kitchen area! love how you have decorated the shelves 🙂 so fun to see all the remodeling! 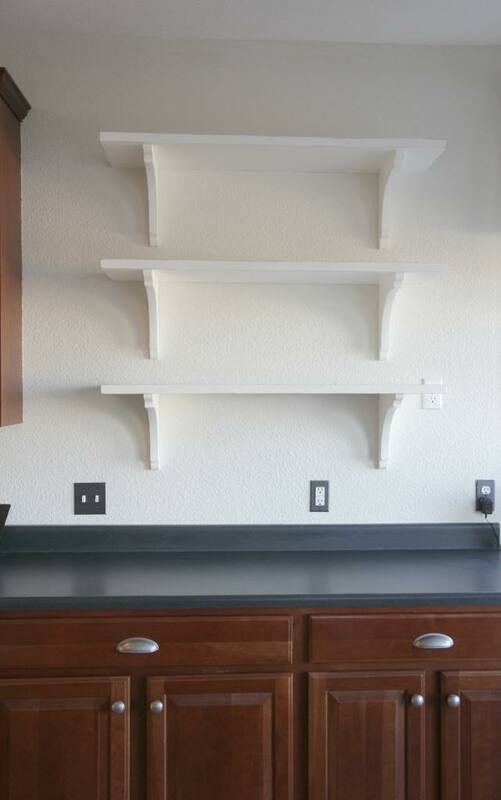 Maybe it’s just me, but I think you need longer shelves. They look too small for the space. Beautiful Jeanne! I cant wait to see the rest of your kitchen!!! It is going to be amazing! Have a beautiful weekend sweet friend! Very pretty and we are doing the exact same thing in my kitchen. Painting over 30 year old cabinets! They started this week. Dishes and cabinet door all over the dining room and living room!! Looking forward to your after pictures. It’s lovely. I’ve been wanting to do something similar in my wee galley kitchen that somehow manages to withstand a family of four! I LOVE the brightness. 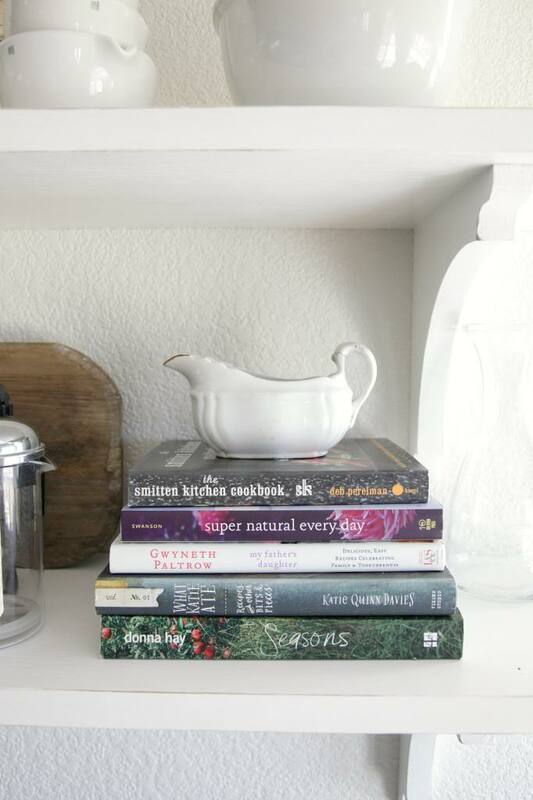 As soon as I scrolled to the photos of the shelves it was as if the “white kitchen angels were singing a remodeling hymn” – ok, a little weird, but you get the point I’m sure! Now. I have a question: What did you do with ALL the stuff that was housed in the 5 feet of cabinets? Thank you for your kind words. We are loving it too. Our new island gave us lots of room but to be honest…I got rid of most of it. I just don’t want things anymore that we don’t use. It was so good to clean out. I am doing that more and more and it makes me super happy! Oh, good answer! Just what I needed to hear! Gorgeous, gorgeous. 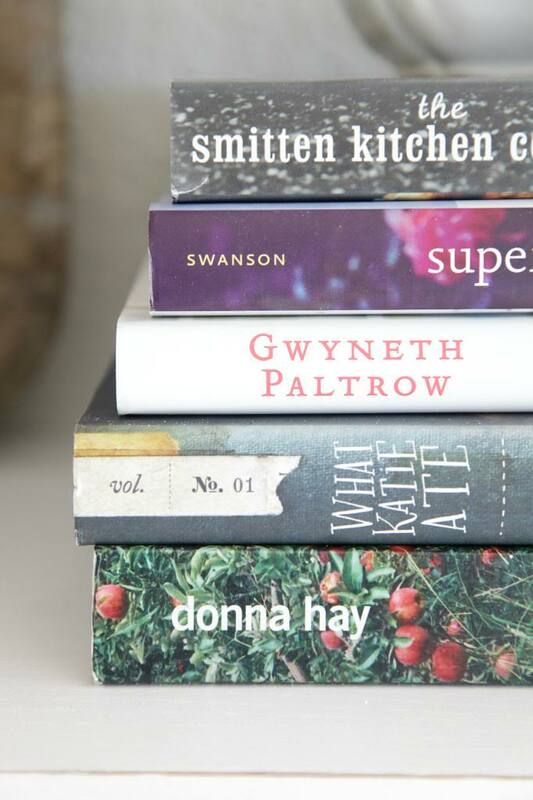 AND, I have What Katie Ate and the Seasons cookbooks too 🙂 I don’t feel I’m organized enough to EVER have open shelving, lol 🙂 I am too much of a visual person, wanting to see it all at the same time, all my favorites crammed on a shelf together. Isn’t it funny how men just can not relate to changes when it comes to wood? Your kitchen is going to turn out beautiful and it will be more you! I think you were right to wait on the changes though..now you know how everything functions. 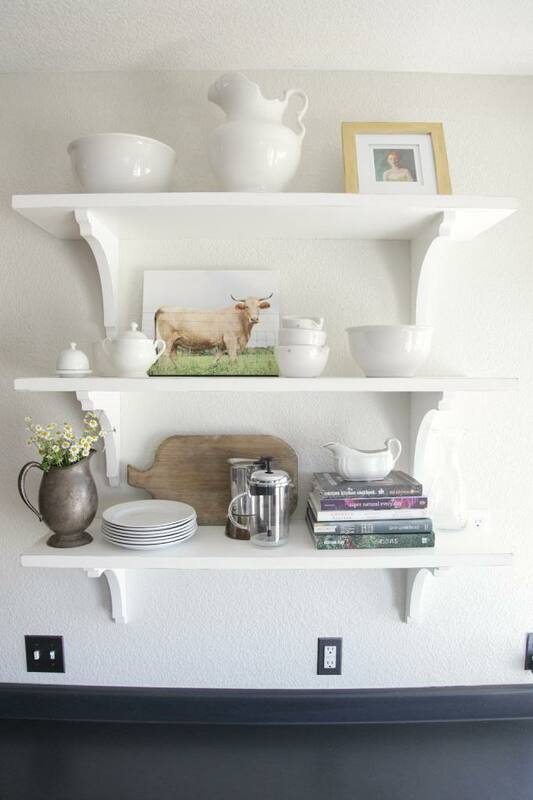 The shelves are fabulous – can’t wait to see the painting. We moved into this house almost two years ago. When we were house hunting I looked at beautiful house after beautiful house and they all had kitchens full of stained cabinets. All I could think of was how will I paint all that? When I walked into our current house and saw the white/glazed cabinets I was sold! Brightens things right up! I love it! 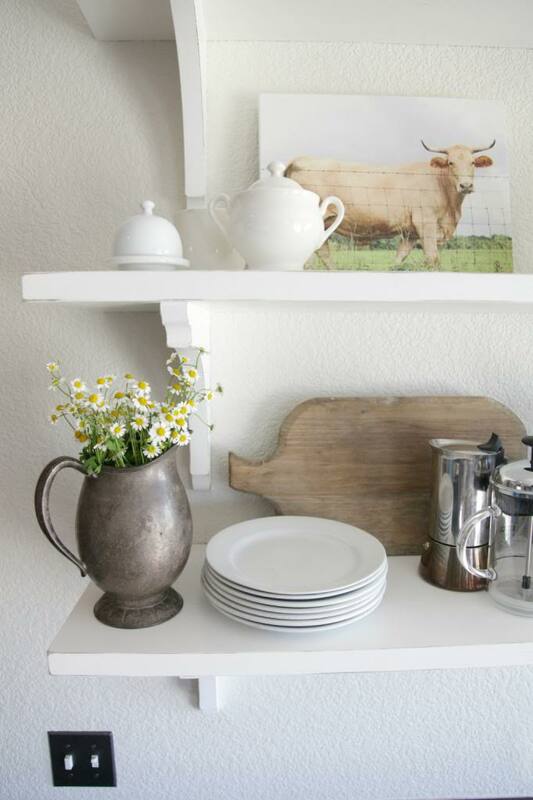 I love your new open shelving and especially the way you have it styled! Simply perfection.